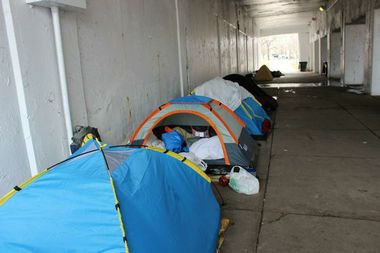 The viaducts at Lawrence Avenue and Marine Drive in Uptown typically attract the homeless. CITY HALL — Mayor Rahm Emanuel is forming a task force to reduce homelessness. Emanuel is expected to announce the initiative Thursday, with Family and Support Services Commissioner Lisa Morrison Butler put in charge. Morrison said right away her task force would not be one that would meet, slap new labels on a problem and move along. "This isn't just let's launch this thing and everyone walks out of the room assuming someone else is doing the work," Butler said Wednesday. Instead, she added, it grows out of initiatives aimed at curbing the homeless problem among veterans. According to Butler, that led to federal and city agencies, public and private, achieving a new level of teamwork in addressing the problem — not only finding and counting homeless vets, but connecting them with agencies that can help in a variety of ways. "Because we've had that success," Butler said, "we can now look and say, 'Can we apply these lessons to other populations' among the homeless? She called it "an opportunity to use the lessons from the veteran initiative." The task force comes as several neighborhoods grapple with issues related to homelessness. In Uptown, Avondale and Lakeview, residents have complained about "tent cities" that have popped up beneath viaducts, but those living there say there's simply nowhere else for them to go. Most recently the city cleared out a group of homeless people living in a vacant South Loop lot. The city also was criticized by advocates for the homeless when it circulated a list limiting the amount of coats, shoes and blankets homeless people could have under certain viaducts. "We are pleased that Mayor Emanuel has assembled this task force to leverage resources and support for our residents experiencing homelessness,” said Nonie Brennan, chief executive officer of All Chicago. "Based on the success that Chicago has seen with our Ending Veteran’s Homelessness Initiative, we are confident that together, we can secure housing for those individuals who need it most." The task force will include 15 city departments and agencies, ranging from the Police Department and Chicago Public Schools, which keeps a count of homeless students, to Chicago Public Libraries, CTA and CHA, which of course ought to be able to issue housing vouchers — "all of whom engage in some way, shape or form with individuals who are experiencing homelessness," Butler added. "We think there's a definite opportunity to coordinate," Butler said. The aim is to achieve "a more holistic approach to dealing with homeless individuals" by asking, "Are we maximizing the human and financial resources that we currently commit?" she said. According to the Mayor's Press Office, the task force will focus on four broad priorities: streamlining contracts and services to improve efficiency; providing critical housing and services to the chronically homeless; developing a plan to reduce homelessness among families with children; and advocating for additional resources to make up for recent funding cuts from the state and federal governments. Butler credited Emanuel with putting an emphasis on the homeless problem and committing his department commissioners to address it. "We as a city cannot thrive until each and every one of our residents can thrive, which is why we are committed to ending homelessness and ensuring that every Chicagoan has place to call home,” Emanuel said. “We have created this task force to ensure that all areas of the city are doing their part to ensure that all residents have a home, and that those who are struggling can get the support they need to get back on track."